– Page 5: Drone lobbyists claimed access to airspace and “Global Conflict – particularly U.S. and allied nation involvement in future conflicts” will “either positively or negatively” influence “market growth” for the industry. Up to 100,000 people are said to be in Tahrir Square now, as police and the army continue to battle with protesters calling for an end to Egypt's military rule. Protesters have had running battles with the armed gunmen working serving the Egyptian government since Friday and are now adamant to stay in the square until their demands are met. So far, reports say that 35 people have died in the clashes. Among the chief demands is calling for a civil government, to take the place of the Supreme Council for Armed Forces (SCAF), the military establishment which has installed itself as the defacto ruler of Egypt after former President Hosni Mubarak was toppled in February. 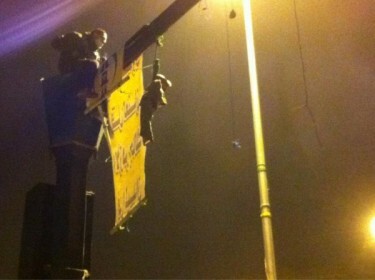 Tantawi's effigy hanging from a lamp post in Tahrir. Picture by Jack Shenker. Field Marshall Mohamed Hussein Tantawi is SCAF's commander-in-chief and demonstrators have been calling for his resignation for months. But trouble is lurking around the corner, be it from the use of excessive teargas, birdshot or even live ammunition. 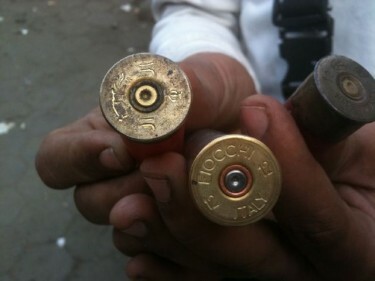 Yasmine G shares a photograph of bullets, one made in the US and the other Italy, used against protesters. 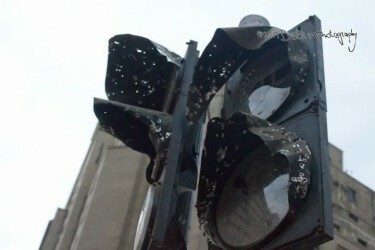 @JonathanRashad: Intensive live ammo being used against us now in Mohamed Mahmoud street. The battle has been going on for 57 hours. Casualties are so high. @Monasosh: There are 23 bodies here. Two are being identified now and three are unknown. Tell the families to come and identify them. 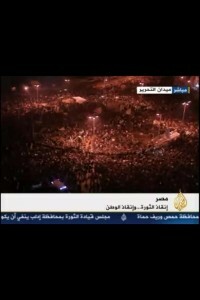 In February, SCAF took over after Hosni Mubarak was ousted after Egyptians demonstrated for 18 days. Since then, Egyptians complain that the new military rulers have worked against the revolution and its goals. Chief among the protesters' cries is the resignation of Field Marshall Mohamed Hussein Tantawi, SCAF's commander-in-chief. Meanwhile, the action continues in downtown Cairo, around Tahrir - as well as in other provinces across Egypt. An officer and non-commisioned officer of the 57th West Middlesex Regiment of Foot. 1855. In the background can be seen a servent with a horse.